Well, I'm posting this really late... 11 weeks late!! I have a very nice friend, Barani Jalandar from college. She had been asking me to visit her native for long. And i had been smitten by the idea of celebrating pongal in the village... and the fact that there is River Cauvery running through their village made it all the more alluring. So we decided to go there for Pongal this year(13th thro 17th Jan'10).. We both bunked college on 13th Jan to avoid the holiday rush in the bus. We started from Coimbatore early in the morning at about 7:00 in the morning and reached there roughly at 9:30. We took a mini bus ride from the bus stand to panneerselvam park, where all the shops like Barani Silks (which was the target for us), Chennai silks etc are located. We had our breakfast at the Trichy Cafe which is well known for its quality taste in food. Shopping at Barani Silks was a great experience. My friend and her family are regulars to that place and since she had befriended some of the staff there it was nice to shop there. We picked some salwars and sarees. We spent nearly half a day at the shop and started to Unjalur and reached her place in time for lunch. I had been warned that her family makes people eat "well" but facing it in reality was a new experience in itself. After the lunch I had to have some soda with salt to be able to walk around. 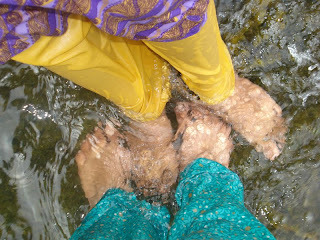 After lunch we went to the river side to get a free fish pedicure done :P we sat there with our legs in water for some time and talked. Later we went to the Unjalur Railway Station... That place.... will talk about it later. We went to a dam about 15 mins away from her place. 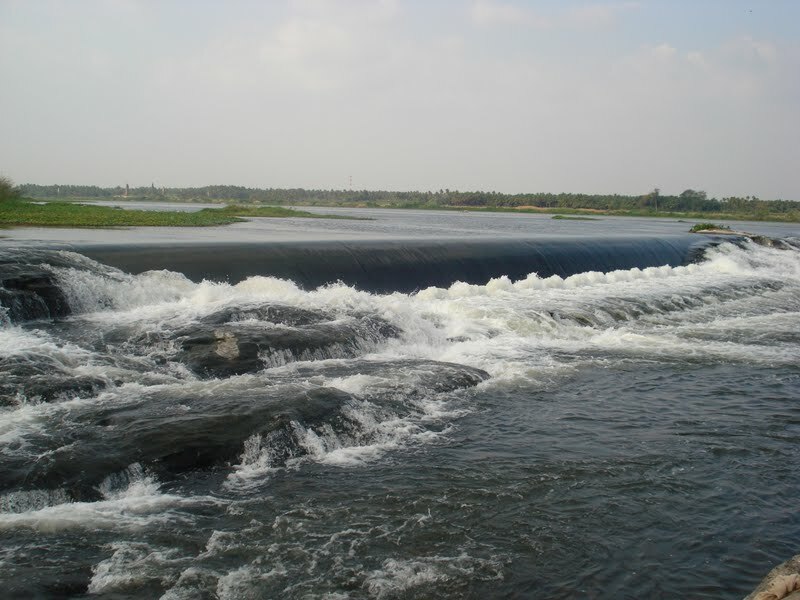 The dam was built to distribute water to both the districts Namakkal and Erode through irrigation canals - I was told. We were playing around for sometime and got back home in the early evening. There is one more important thing... Kilinja jeans, funky t-shirt, paratta thala, color mudi, china set nu city la pasangala paathuttu... vaetti sattai la village la pasangala paakka avlo nalla irundhadhu... it was so refreshing... from then on I decided that when I get married I must make my man wear dhoti from time to time. We had actually planned to go to kodumudi that day... but all the over eating had caused my digestive system to perform over time and it was upset about it :P so we just spent the evening at the railway station. The railway station at Unjalur has become closer to my heart. It is perfect for having heart-to-hearts and walking in the evenings. People will want to either travel down memory lane or open up and talk... The place has got its charm. I told my friend that I would want to spend an evening in the railway station with my better half. We had to get up early... We decided to go home by train. The buses would be too crowded. So we took the Egmore - Mangalore express from Unjalur and landed at Coimbatore at about 11 in the morning. Wow!!!! I envy u!! Its real long since i spent time in a village like this.. So barani darling enna eppo unjalur kuptu pora????!!! Unjalur Railway station??? I could imagine sweets!! U in that full white salwar, the guy in white dhoti n red/green/yellow shirt wid murukku meesa slow motion la vandhu oru heart to heart ha ha ha rofl! :) :P :D..
kums realy proud of my village.ennoda villagea ivvalavu alaga sonathuku romba thanks.next time you will come pls inform to earlier. guess i've already heard abt it in class and visually experienced it in ur snaps :) but i hav to say it was a good read !! and btw ur tan did reveal ur experience :) !! Nicely done... It makes me to remember my past. I'm also a guest to this place and I visit this place often in the past.